So you love to shop at Goodwill. So does your family. Maybe your friends love it too. Now you or someone you know can give the gift of thrill shopping to anyone! 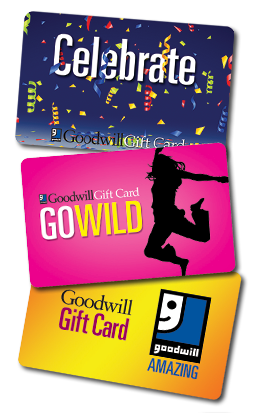 Goodwill Gift Cards are a great gift idea and your purchase helps to support the Goodwill mission. What could be better than that? They are available in any denomination and come in three great designs. You can get them at any Goodwill Store & Donation Center. Just stop by the register and tell an employee that you want to purchase a gift card today! This card can be used at any Goodwill Store & Donation Center in the following counties in Southeastern Wisconsin and Illinois. Click here to find a list of Goodwill Store & Donation Centers in this service territory. When you make a purchase with a gift card, your receipt will show the remaining balance. Gift cards are not redeemable for cash, except as otherwise required by law. Lost or stolen cards will not be cancelled and replaced without proof of purchase. Contact your store for details. Your gift card balance is located on your most recent sales receipt. If you are not able to access this, please check with one of our friendly cashiers on your next visit to our Goodwill Store & Donation Centers. Gift cards automatically expire 12 months after purchase or such longer period as may be required by law.